For cutting lines and curves in wood, metal & plastic sheeting, this powerful cordless jigsaw ensures control & accuracy away from a power source. 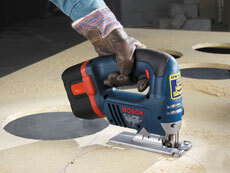 SAME DAY SAVER: Pick up and return this Cordless Jig Saw on the same day – and claim a 20% saving on our 1st Day rate. This excludes “delivered” items. Ensure you check branch opening times! Can't be used in conjunction with any other discount.